As we kick off the long weekend here in the US, there are a number of updates for YouTubers, Plussers, Webmasters and more. The biggest stories: Google Fi gets RCS, YouTube is cracking down on dangerous pranks, Google+-related services are winding down and there's a new platform for news organizations. YouTube will be cracking down on dangerous pranks and challenges, resulting in Community Guidelines strikes (3 strikes in 90 days and you’re out!). Not only does it include pranks that could cause serious danger or death, but also pranks that make victims believe they’re in serious physical danger, or cause children to experience severe emotional distress. YouTube will also strengthening enforcement around custom thumbnails and external links that egregiously violate the Community Guidelines. RIP Annotations: This week Annotations were removed from YouTube videos. They were replaced by Cards and End Screens in 2017, but existing Annotionations were not removed until now. Annotations were visible on the video itself, rather than behind a button the way Cards are, and they were often used creatively. The down side of Annotations was that they could be visually annoying, and - more importantly - were not visible on mobile devices. Cards aren’t very creative, but they are visible everywhere you watch your video. Also this week, YouTube “Shows” playlists were converted to regular playlists, and “Movies” become standard videos. These features were only available to a limited number of creators, and so probably won’t impact most folks. Google+ continues to update features aimed at business users. You can now embed Google+ Search result streams in the new Google Sites. The option to embed Google+ Profiles, Collections and Community Streams was introduced in July 2018. While Google+ still hasn’t provided any details about the shutdown process for consumer users, companies that provide services dependant on the Google+ API are removing Google+ support. 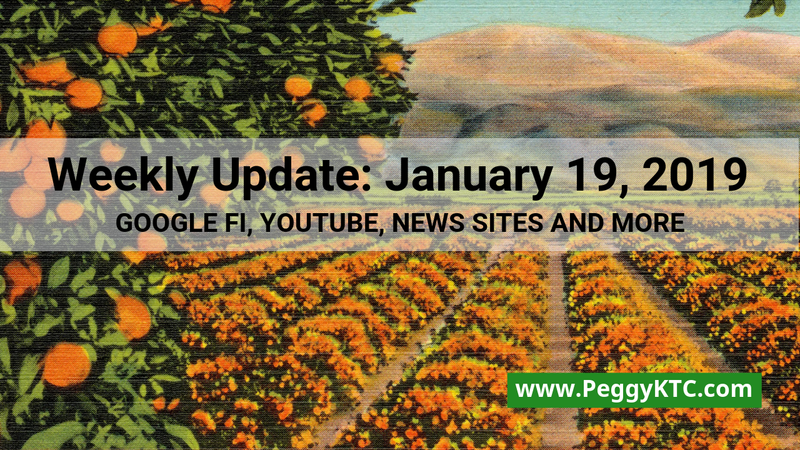 While the Google+ API isn’t shutting down until March 7th, Google did announce there will be intermittent failures starting January 28th. Buffer announced they will stop supporting Google+ on January 25th and HootSuite will remove support on January 28th. The official Google+ Moderators Community became inactive on January 17th. Posts are still available for reading and commenting, but there will be no new members and no new posts. This follows the Google+ Aspire Community, which became inactive on January 10th. Google Fi gets RCS: Last December, Google explained that one focus of their messaging service strategy is to “upgrade SMS so that people around the world can more easily enjoy group chats, share high-res photos, and get read receipts on any Android device” with “Rich Communication Services” or RCS in Android Messages. This requires both device manufacturers and mobile carriers to get on board. At the time it was noted with some irony that Google’s own mobile service, Google Fi, didn’t support RCS. Now, finally, Google Fi has RCS support. This is enabled automatically on “designed for Fi” phones, and can be enabled on other supported Android devices. Extra Extra! Newspack by WordPress.com is a new platform for small and medium-sized digital news organizations backed by the Google News Initiative and a number of other news-supporting organizations. If you are a part of a news organization that is interested, submit an application at newspack.blog . If you have a news site now, and aren’t looking for a new content management system, Google Webmasters has posted a number of tips for getting your content into Google News. Have you wondered what the web might look like when the European Union’s new copyright directives go into effect? Google has been testing news results with no headlines, snippets or images, apparently to see what compliance with Article 11 looks like. And YouTube has posted a mock-up of what it could look like under Article 13. If you are thinking a lot of blank spaces, you’d be right. And yes, I think Google is likely to redesign pages shown to European users in a way that both complies with the new rules, and emphasizes there is missing content. Read on for more links, tips and updates for YouTube creators, webmasters, AdSense Publishers, GSuite administrators and more. Image: Golden oranges and snow on Old Baldy, California. By Tichnor Brothers, Publisher - Boston Public Library Tichnor Brothers collection #63825, created between ~1930-1945, Public Domain. Why this image? It's orange season in California, with the remaining Los Angeles county groves overlooked by a snowy Mount Baldy (real name: Mount San Antonio (although no one calls it that)). January 28: There will start to be “intermittent failures” of the Google+ API. The Google+ API will be fully shut down March 7. The Google+ API lets external sites and apps connect to Google+. Much needed and interesting news updates for online marketer. All are connected to internet, so daily updates required for bloggers. I daily visit nexter for daily updated news about whole world.